I think the question, more directly, is why is every hunter a grizzled 30 year old man? That question deserves more attention that I can give it here, but in a nutshell I think it's because nobody at Naughty Dog wants to invite serious critique of the in-game violence. TLOU has received some attention for its thoughtful consideration of violence. The game never revels in its gore and it's never really "fun" to stomp a hunter in the head; and the violence feels thematically appropriate to the game's story. I agree with all of that to a point, but would we say the same things if we had to kill women? (Admittedly, Joel does kill one, in a cutscene.) Or an adolescent boy? Or even a young 18 year old man? Would that emphasize the thematic punch of the in-game violence, or would it make us realize that Joel murdering hundreds of people is obviously ridiculous? The game pulls a few phony tricks to make you think Joel is a moral character, or at least not immoral. Joel almost never instigates violence against other humans, but hunters will always attack you on sight. Every hunter is morally compromised because they're firing at a 14 year old girl, but Joel only ever had to fight anonymous bad guys. Or what if we WERE a woman killing other women? Despite the apparent agency of the women in TLOU, the entire story is predicated on three women being unable to do what Joel can: Marlene can't safely transport Ellie (despite reaching the final destination well before Ellie actually does); Tess dies early in the story and asks Joel to finish the job; and Ellie, despite her gumption, is unable to adequately protect herself. Why, exactly, didn't we play as Marlene instead? Or Tess? 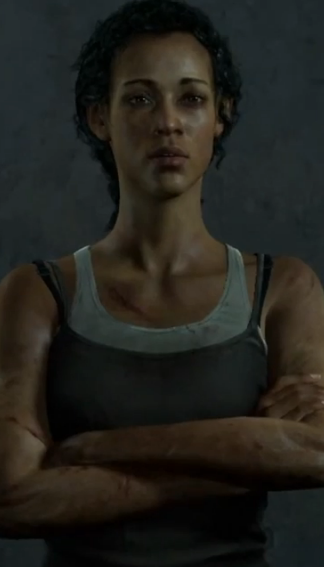 Or Ellie, for the whole game? I don't mean to sell TLOU short: The game is absolutely built around Joel and you couldn't simply swap a character out and tell the same story. In general I think the game is a big achievement and tells a sophisticated story. But I think we should be careful crediting TLOU for its treatment of women. "For a video game," it's great. But that bar is set very low. Another point to consider is the game's multiplayer mode, which does have female avatars. I think it even randomizes your avatar's gender and appearance. I thought GTA4 had a similar problem. Obviously, the civilians in the open world are all lampooned and killable, but all of the named female are all saints with little humor to their depictions. Meanwhile, all the men are violent buffoons, making it seem like Rockstar just wanted to avoid satirizing women specifically. Same goes for Red Dead Redemption, now that you mention it.